Project Type Power, Data, Lighting and mains distribution. Description Konect was appointed by Brown & Bancroft for works to a fit out project for Agility’s new regional headquarters at Hurricane Court, Speke. The project provided a large multi-functional meeting room, a state of the art café and meeting space for staff, together with large open plan floor plates to enable the business to interact and communicate easily. 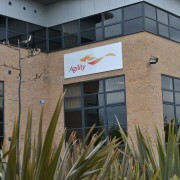 Agility are one of the world’s largest integrated logistics providers.